Sharks for the idea of making Solid-on-Top behaviors for doors like these. You should make both doors with and without the Solid-on-Top behaviors (but you might have done it already). Yeah, I already did that. The Solid-on-Top door is a new object in the jyotyu tileset. It doesn't replace normal doors. Even though the hack has gotten a very fair amount of downloads, I have yet to come across any signs that people have actually been playing the hack. No one talking about the levels, or their achievements, no playthroughs on YouTube, no screenshots taken by others. Can I have a show of hands (or in this case, posts) for how many people have played through the hack? What did you like about it? What didn't you like? Was it enjoyable? I'm hungry for some feedback. Since you're hungry for some feedback, here's my two cents. I downloaded this hack and looked forward to playing, but I dropped it after the first few levels. The reason why I didn't like it so much is because I honestly expected a lot more creativity. After playing through the vibrant worlds of the Clone Tag Team series, I was expecting things such as re-vamped world maps and possibly custom music, but I instead found the old unchanged NSMB assets which could have easily been re-done in SMB2 style. It seemed a little lazy in my opinion. I'd totally play it all the way through if there was more custom content. I love not knowing what I'm going to find next, and the seeing all those old world icons and such meant I pretty much knew exactly what I was in for. It's an okay hack in it's own right, but it feels too unfinished to be a great one. There's a lot of unused potential and you could have done a lot more with it. Thank you. That's a good and honest response and it's respectable. I like your gumption. Truth be told, the reason the hack had a mere six-month development time was because I didn't want to spend all that much time and effort on a remake hack, when I could prioritize my planning on Endless Earth, which I always intended to be the real successor to the Clone Tag Team games. Also, the intention from the get-go was to rebuild Super Mario Bros. 2 as if it were a NSMB game. Originally the hack was just going to have the 20 old Super Mario Bros. 2 levels and nothing more- so I'm glad that it eventually became something more. I enjoyed this hack, but the relatively limited amount of level variety hampered an otherwise decent hack. One main problem I have is trying to find the first star coin in level 8-5. This level seems to be similar in many ways to NSMB's 8-1. In fact, the second and third star coins were in roughly the same places they were in NSMB's 8-1. However, the first coin, which required the use of a trampoline to get to in NSMB...seems to be impossible to find or missing. Perhaps the lack of a trampoline has something to do with it? I've found pretty much every other star coin in the game (apart from the first two in Bowser's Castle--a faithful remake of SMB2's 7-2). Either this problem coin is in another area near the beginning of 8-5, or...it was somehow deleted by mistake, leaving the level slightly unfinished (incomplete set of star coins), or it was left in the same place as in NSMB's 8-1, but is unreachable due to the lack of a trampoline or growing vine. 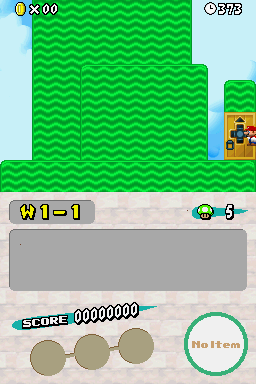 World 8-5 is a remade level from my first hack, which was based on NSMB's 8-1, so that's why it bares similarities. As for the Star Coin, it is in the hack and it is obtainable, but it's difficult to find and reach. The way to the coin is shortly past the Banzai Bill cannon. Do you have to drop into the pit? I've tried jumping off of a Banzai Bill to see if a warp trigger would happen, but...nothing. I think I have tried jumping into the pit after the Banzai Bill cannon, but I think it only cost me a life instead. Is there any sort of reward for getting all the star coins (besides the extra bottom-screen backgrounds)? There is a "+ Take 2" at the end of your game's title. What significance does that have? Also, I found a strange bug in CTT1, involving a pair of pipe cannons. If your clone uses one, but you don't, he lands far off-screen. Then when you use one, you land right beside your clone...then the game freezes. Was this meant to happen, or is it just a "hiccup" in the programming, involving having two Marios on-screen at the same time? Whenever your clone dies in either CTT1 or CTT2, it costs YOU a life, as well. However, you can leave your clone behind in many cases, just by entering a pipe when they're not right next to you. The concept of a second Mario on-screen suggests that maybe Yoshi could be inserted into a future NSMB hack (in place of the Mario clone). Moving Buzzy Beetles without legs. Not glitchy at all! It is funny that you used the Fuzzies. The hack doesn't really have music in it. If you took some music in the game, it would be SMB2 Like. Another problem was the levels. They are so short. 1-2 is too short. I can complete most of the levels in a second. I'm not trying to be mean, but I thought this wasn't a good hack. I'd say Something Super Mario Something was better or Bombette's hack. Most of the levels in a second... Maybe you are cheating, just saying. I'll be a bit more specific in my Star Coin hint: The answer lies between the two stone blocks in the middle of a hole. There's nothing special besides unlocking that Bottom Screen backgrounds, unfortunately. The title has Take 2 in it because the project is a merging of two hacks. The first being my SMB2 remake, New Super Mario Advance, and the other is a remake/revision of my first hack, New Super Mario Bros. 2, which I titled "Take 2". The bug with the cannons is a glitch that only occurs when running the ROM on real hardware. If an emulator like DeSmuMe is used, the game won't freeze. Posted on 03-26-15, 07:55 am, deleted by MarioFanatic64: eh, what? Well, you'll be happy to know that your Clone Tag Team 2 doesn't suffer from that glitch, but the game has an irregular difficulty spike. Some levels, especially those involving a clone, tend to be much harder, as if they're trying to force you or your clone to die, usually by forcing the clone offscreen where you can't monitor his movements. I've been able to correct some of this issue by making the clone overlap with Mario (which seems to protect the clone due to Mario's cheat-code-enabled invincibility). However, cheats do NOT cause the game to glitch up or freeze. Here's an update to New Super Mario Advance + Take 2! This update adds a few custom music imports and minor changes- not enough to significantly change the hack's playability, but it's an upgrade nevertheless. I played the lauched version. 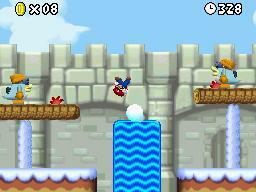 I can say: New Super Mario Bros Advance + Take 2 is a game for “macho men”. In this version, the protagonist will need a lot of balls to go through eight worlds with relative comfort. If the player want a piece of cake, sit on pudding. If the player decide to venture into this version, get ready, because you will find a lot of challenges. New sprites, sand a lot. First the player will realize that just what we have available, with some exceptions, are red mushrooms. And be satisfied with that. Mushrooms besides being peppered here and there, are found in small amounts in levels. You’ll be lucky to find more than three at the same stage. This does not mean that you’ll be orphan of a mushroom. Also I am not saying you will start and finish every tiny in all levels. What it is trying to say is that you will need to save your power. So use your mushrooms wisely. It is the same with coins. OMG, these are rare as the gold which are made. Very few are found. And a houndred of these to win a life, the player will have to sweat the shirt. About this, let’s also speaks of lives. There 1UP mushrooms here and there, but in very timid positions and unfavorable in some ocasions. But what you want? I said that this game is for “macho men”. Another point that the player will notice is that the levels do not have middle point. This means that the player will have to face the level from start to finish. Ie if the player die along the way will have to face all the path again. This does not mean that the game will be harder. In fact leaves it in a challenging situation. This may not delight all the players but after all it is impossible to please Greeks and Trojans. The third point that player can see, is the length of the levels. They are larger and more elaborate. The player will come across levels that mix vertical and horizontal paths. With certain constancy. You will also come across many areas that mix different varieties of landscapes, objects and scenarios. The setting in the adapted world of Super Mario Bros 2 is quite pleasing to the eyes of the players. It’s possible see that there was an effective effort developing the landscape of this game. Of course, for technical reasons, the core can not represent all the specific aspects from the NES version. But these technical aspects are well outlined, with the substitution of equivalent sprites or tiles. 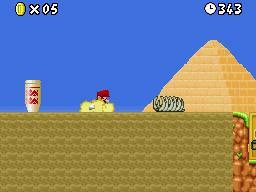 Sand or soil are replaced by soft bridges (one type of block which Mario falls to stay long stopped above). And a plenty of other new features are found in this adventure. Damn snow balls! Are you a "macho man"? 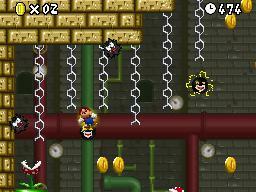 The Star Coins are arranged on levels in a quite fairly situation. There are nor too difficult nor too easy Star Coins. The position of these coins are spread across the levels in a random mode. 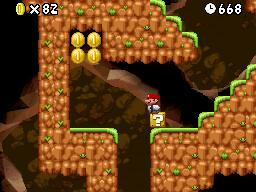 At one level, the player can grab all the coins in a very easy way. Another level it seems that you will give birth to a child, born with forceps. I would like the reader observe all these points not like a criticism, but only as peculiarities of this version. The NES version was very hard (is very hard!) and may be more than this version. This difficult can not be used here as a negative point of this story. Once the Star Coins are scattered in relatively abundance on the way from the different levels, you can always record your progress in any mushroom house. Anyway, the tip is: save your Star Coins for the end to use these preferably in the world 7 or 8. Obs. : World 8-Tower 2 froze in some flash cards (1) (2). Posted on 07-06-15, 03:32 am, deleted by MarioFanatic64: Please don't make short posts. But this is my first impression for the game. Thank you, MarioFanatic64. I am just a bit disappointed. This is a really massive bug! It's in W1-1, and if you discovered this it stops you from playing the game.